On one hand, in Teen Titans Vol. 1: Blinded by the Light, writer Will Pfeifer convincingly transitions what was a covert and somewhat accidental collection of teen heroes into a full-fledged Teen Titans superhero team, complete with twenty-first century super-fame. But on the other hand, Pfeifer relies too much on the audience's existing knowledge of the Titans -- a bad idea when this title is meant to relaunch DC's Titans franchise -- and eschews most character development in favor of an ultimately repetitious plot. The Titans have an interesting status quo by the end, but this does not feel like a strong enough debut to draw new readers to the fold, which is what Teen Titans ultimately needs. At Blinded's conclusion, the Teen Titans are quasi-operatives for STAR Labs, and taking their lead from STAR scientist Manchester Black, who plays a role not dissimilar from Harrison Wells on TV's The Flash -- part affirming mentor, part scheming bad guy. That's an interesting dynamic, and fortunately the Titans are kind of in on it too, not being fooled. The Titans have historically had a relationship with STAR, and some of artist Kenneth Rocafort's depictions of Raven teleporting the Titans to outside STAR in Manhattan evoke the original Marv Wolfman and George Perez stories (though the absence of Cyborg makes the STAR connection a bit less natural). It seems Red Robin wants to try to take advantage of the benefits of Black and STAR without falling victim to the pitfalls, and I'm curious to see how this flirtation with the dark side unfolds. Pfeifer also introduces a gang of roving Wonder Girl groupies, and as well a band that's fashioned themselves after Raven. Though Pfeifer puts the cart slightly before the horse in how these groups even found out about the heroes, both demonstrate popular fame in the modern era, and that's even before the Titans start trending on "Chirper." Ultimately I found the Wonder Girls a bit silly (to the extent they threaten to beat up Wonder Girl's mother simply because she's heard talking about Wonder Girl), but I'd like to see what happens to the two kids who recorded one of Raven's magical incantations; Raven's entire interaction with the band has a humanizing effect on the character that I enjoyed. At the end of the story, Pfeifer has the team save New York, broadcast in the sky via hologram, such that the Titans are truly "out." Under the auspices of the New 52, the Titans are no longer an official group of sidekicks, with many of them having no relationship to their Justice League counterparts. Now that the Titans have gained fame, I'd like to see Pfeifer show how that resonates through the superhero community; I understand the absence of Titan/Justice League team-ups toward unfolding the New 52 DC Universe slowly, but with the DC You and so on, I feel that horse has sufficiently escaped the stable by now. Pfeifer positions the Titans well to be "big" in their fictional world and also to have some high-profile adventures in their comics series. All of this unfolds, however, against a less-than-stellar backdrop. In the first four issues, the titular "Blinded by the Light," the Titans first stop a runaway bus (controlled by a disgruntled robot), then an explosion at STAR pits Beast Boy and Bunker against the robot, then the robot attacks Raven at a club, then the robot hunts Red Robin through STAR. All of this is part of Manchester Black's plan, but in practice the conflict doesn't escalate nor the plot build; it's just four repetitive issues of the Titans fighting the same robot. Most of the time the conflicts don't have anything to do with the Titans, making their presence in the story feel forced. Beast Boy and Bunker get involved because they just happen to see an explosion at STAR; Raven's at a club and the robot attacks, so therefore she fights. In later issues, a group of kids high on power-granting drugs just happen to land in front of Wonder Girl; then Black tells the Titans about a potential second explosion at STAR before, sure enough, it indeed happens and the Titans are drawn into the fray. Even again as Manchester Black pulls most of the strings, Pfeifer doesn't give the Titans much of an interior life or purpose short of pointing them in the right direction to involve them in this or that action sequence. 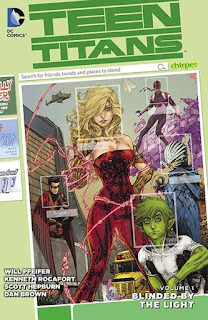 The biggest problem is that Pfeifer starts in the middle with the Titans as already a team when they went their separate ways at the end of the last book, and offers no explanation for existing readers as to how they reunited, nor for new readers as to why these kids hang out together at all. There is nothing here as to the nature of Wonder Girl's powers, or Raven's, or Beast Boy's; even as this might be repetitive for some, I'd think it incumbent upon Pfeifer, launching a "new" Titans series, to in one way or another get the audience acclimated. Nor is there any sense of what the Titans do when not in costume, whether they have day jobs, and so on. Further, Pfeifer would seem to get the character of Bunker Miguel Jose Barragan fairly wrong. In a list of good things to come out of the New 52, Scott Lobdell's Bunker would be high up there -- a gay character who's out, proud, proudly flamboyant, and also permanently optimistic, an all-too-rare gay character where his sexuality never seems to have been a burden, just one aspect of who he is (if Miguel seems to have it easier than most, he's at least aspirational in that fashion). At the end of the first chapter, however, Bunker attacks a bystander because of a perceived (not explicitly-stated) gay slur, and proceeds to act surly and un-Bunker-like for the rest of the book. No argument that slurs are offensive, but Bunker as a loose cannon who hits a stranger and tells him super-powered heroes can be "very, very dangerous" is a significant mis-reading of Bunker, who I think would as soon try to make a friend of the man or brush off the comment than resort to violence. Not much differently than New Suicide Squad, DC Comics has a viable and oft-very-popular property in Teen Titans, and after the initial New 52 iteration didn't take hold, this relaunched title would seem an opportunity to correct old mistakes and start stronger. But again, like New Suicide Squad, Teen Titans Vol. 1: Blinded by the Light is no more gripping, relevant, or modern than the Scott Lobdell series that preceded it, and Lobdell would seem to have done better, even, in giving the Titans interior lives. I go back to Runaways and Young Avengers, not to mention various X-Men groups, Marvel teen-team series with edge and bite. It's been a long time, almost never, since DC had the same; Teen Titans needs to be that title for them, but unfortunately this new series isn't it yet. Totally agree with everything you said. I couldn't even be bothered to say much in my review (not published yet). But another thing that bugged me was Beast Boy shifting his shape so often, often multiple times per page! That got old fast. I don't know that I can find fault in Beast Boy changing his shape a lot, and I did like the part where he becomes a fruit fly because they have shorter lifespans and therefore time moves differently for them (this opens up a giant range of storytelling possibilities in that Beast Boy doesn't just look and act like the animal, but takes on its physiological aspects, too? ), but yes, in all, not the Titans book we were looking for.